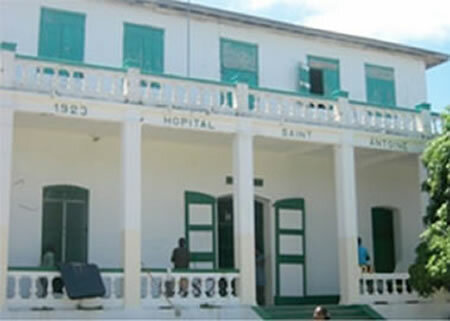 Hospital Sainte-Antoine de Jérémie is a public hospital located on the Avenue Emile Roumer Bordes, Jeremie that was founded in 1923 to serve the people of Bordes and its neighboring inhabitants. Today, the hospital with its 40 maternity beds and outpatient department serves over 1,000 patients every month. It offers some of the most essential services within its limited scope and ability such as, immunization, serum culture, X-ray, physiotherapy, ultrasound, maternity, emergency and intensive care. The hospital operates 24/7 and the outpatient department is open: Mon - Fri 8 am to 4 pm. Deliveries and C- Sections are free, Surgeries cost 2,000 Gourdes or $50.00. Contact person: Medical Director--Dr. Jean Marie Duvilaire (Tel: 509-3604-9768/ 509-3733 1104) and Administrator: Mr. Gilbert Pamphile (509-3460 9041).